With the weather changing, I decided to research one of my favorite cold weather beverages. For many years, I have bought the hot chocolate mixes. It was quick and easy and you could drink the “diet” product with only 25 calories! I never paid much attention to the ingredients, but my gut told me that I wasn’t going to like what I going to read. With that being said, I began my search with the most important ingredient, cocoa powder. 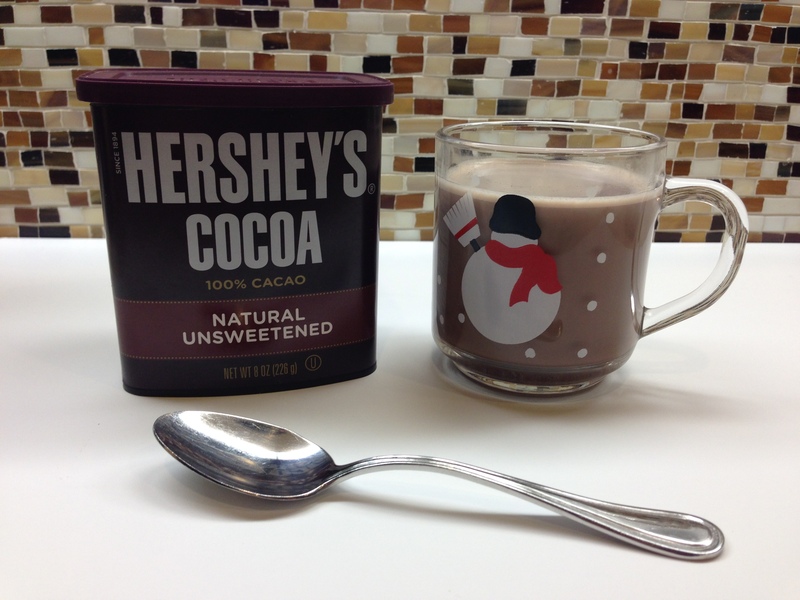 In Cook’s Illustrated’s “Supermarket Cocoa Powder,” published November 1, 2012, they named Hershey’s Natural Unsweetened Cocoa as winner of their taste test! Upon the recommendation of Cook’s Illustrated, I bought the Hershey’s cocoa powder and another popular brand for comparison. First, I made the hot chocolate drinks using the two different powders and sweetening them with Stevia. My husband I both agreed that the Hershey’s cocoa tasted the best, but we were not happy with the taste of sweetener. Then I decided to try turbinado sugar. It is a less refined sugar and a popular brand is “Sugar in the Raw.” We both agreed that it was up to our standards and were happy to know that we won’t be drinking all those additives anymore! Heat milk in microwave or on the stove. Add cocoa powder, sugar and vanilla extract. Stir well and serve.